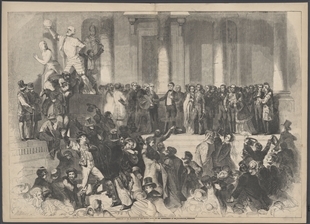 For Europeans, all America (even staid Washington, D.C.) had an air of the Wild West in the 1870s, when the Illustrated London News published this fanciful image of a crowded Capitol Rotunda. Native American headdresses, turbans, and scruffy long-haired pioneers populate the background. In the center, a recently enfranchised African-American visitor is near, but not conversing with, a group that includes an Uncle Sam look-alike and a cigar-smoking lobbyist. 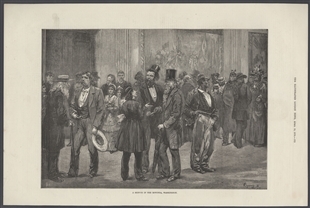 The only identifiable person in the print is Dr. Mary Walker, famous for pioneering women’s entry into the medical field, standing with her back to the viewer. She did spend time in the Capitol, and is likely depicted here, in her usual garment of trousers and tunic, as a New World curiosity. 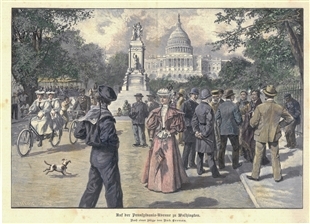 The Rotunda is the symbolic and physical heart of the U.S. Capitol. 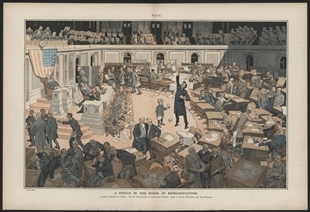 The circular room functions as the Capitol's principal circulation space that connects the U.S. House of Representatives and U.S. Senate. In this video, House Curator Farar Elliott describes and recounts the history of the Rotunda's art featuring Native Americans, which thousands of visitors view each day.